Major equity indexes made up the ground lost earlier in the week on Friday after the Labor Department’s Goldilocks jobs report and a surprise result in the U.K. elections. The S&P 500 rose 1.35% on Friday to finish the week essentially flat. The Nasdaq Composite was basically unchanged for the week. And, the Dow Jones Industrial average rose 1%. For the past few weeks the markets have failed to advance, pulling back every time they reach previously recorded highs. Even the better-than-anticipated earnings season cannot push equities through this resistance. So far, about 90% of the S&P 500 has reported earnings, and growth has come in at 0.1%. This is far better than expectations of 4.7% declines heading into earnings season. On Friday, the U.S. Labor Department announced employers added 223,000 jobs in April, and the unemployment rate fell slightly to 5.4%. Equity markets applauded this report because it was a strong rebound above March’s disappointing result, but not so strong to raise concerns about the Federal Reserve raising rates sooner than anticipated, which is now the September time frame. This expectation also pulled down bond yields. The yield on the 10-year Treasury slipped to 2.13%. Wage growth remained moderate. 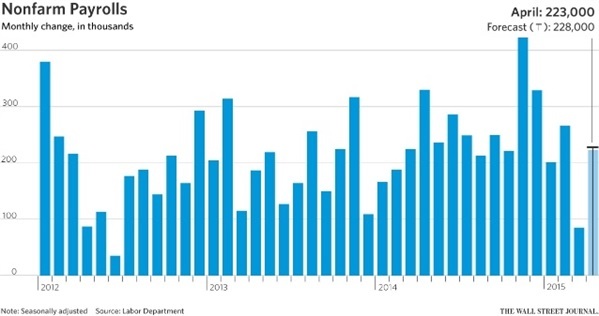 Hourly pay rose 2.2% year over year. Last week Federal Reserve Chairwoman Janet Yellen joined the International Monetary Fund’s managing director, Christine Lagarde, in a conversation before an audience at the IMF’s headquarters in Washington DC. At that event, Ms. Yellen gave investors a moment of déjà vu declaring that equity market valuations are “quite high.” While this wasn’t as bold as Alan Greenspan’s “irrational exuberance,” investors responded by pushing the market lower. The S&P 500 now trades well above its 10-year average price-to-earnings ratio but as the Chairwoman also noted, valuations are “not so high” when compared low bond yields. It’s also worth noting that Alan Greenspan’s comments about irrational exuberance occurred before Congress in December 1996. That bubble continued inflating for more than three years before bursting in March 2000. As U.S. and Iranian relations begin to warm, all eyes are on the oil market. Iran is the world’s 7th largest producer whose approximately 3.4 million barrels per day account for roughly 4% of total production. 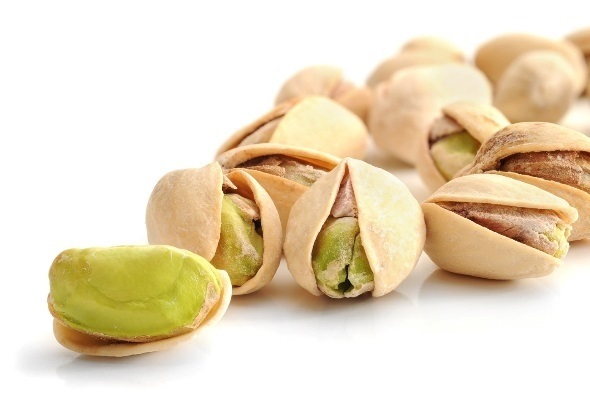 However, loosening sanctions could have a bigger impact on a lesser followed commodity: pistachios. The U.S. has grown to become the world’s largest pistachio producer and the crop, which almost entirely comes from California, was worth over $1.3 billion in 2014. The acreage devoted to the crop has more than doubled over the past decade. Iran grows roughly the same amount each year (500 million pounds), and the nuts are that country’s second largest export behind oil. The U.S. has banned the import of Iranian pistachios since 2010 and prices have risen nearly 40% since then due to supply shortages. Iran’s oil minister has hinted that the country will increase oil output almost immediately after sanctions are eased. We should expect the same for pistachios. The debate about genetically modified food continues. In fact, recently Chipotle became the first major restaurant chain to ban genetically engineered foods in its approximately 1,800 locations. The move was championed by Chipotle CEO, Steve Ells, who has always been at the forefront of using higher quality and environmentally friendlier ingredients. However, Mr. Ells probably eats a genetically modified food every Thanksgiving without even knowing it. A team of scientists from the International Potato Center in Peru recently analyzed the genome of several varieties of sweet potatoes and found that each of the 291 cultivated varieties had DNA from a microbe commonly used to genetically engineer plants. This agrobacterium is known to infect plants in a process called horizontal gene transfer, and it is in fact probably what transformed sweet potatoes into the edible plants they are today. Next time you are concerned about eating genetically modified foods, consider we’ve been eating them for thousands of years already.